Philip S. Heath (1949 - 2011) British doll artist was a master at capturing a child's heart and soul. He was known for his limited edition, hand painted child dolls modeled on real children from around the world. Philip Heath was born in England, lived in Bruges, Belgium, where he had his own gallery. Philip Heath worked as a senior doll designer at the German doll company Gotz for more than 25 years. In 2000 he left Gotz and in 2001 opened his own studio in Valencia, Spain. His Lost and Found and Past and Present series of dolls were created in pairs, showing before and after depiction of the same child at different moments in his or her life. 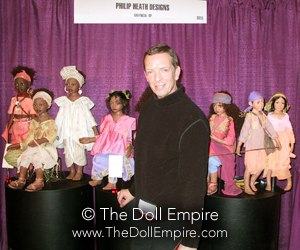 Philip Heath created dolls of memorable children of various nationalities from all over the world, whom he met during his many travels in Asia, Malaysia, Africa, the Philippines, the USA and South America. Since 2007 he no longer created dolls. Heath died on November 28, 2011 in Worcestershire in the United Kingdom. He was 62 years old.